Pepper Jungle House is an architecturally designed, fully staffed villa perched on top of a lush jungle ridge. Nestled within landscaped gardens, the villa offers complete privacy, yet is just 3km to beaches and 4km to UNESCO Galle Fort. Completed in September 2016, the villa is a blend of imported luxury and local charm. 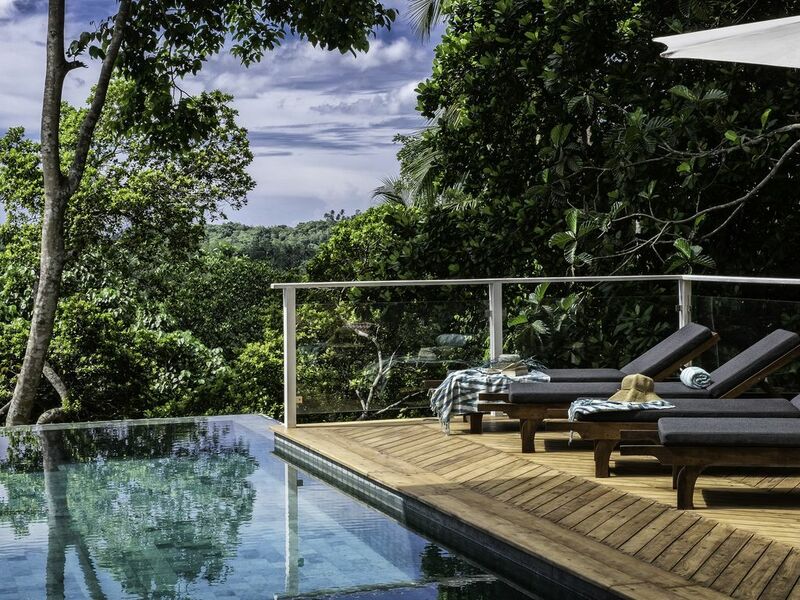 Elevated above the surrounding landscape, a large teak deck and 8m infinity edge pool allow you to soak in the stunning jungle views. The spacious master bedroom includes a large ensuite with both indoor and outdoor rainshowers, an open air bath tub, and balcony access. The second bedroom has a large ensuite, rainshower and Sri Lankan teak finishes. The third bedroom is a TV room or third bedroom, with a queen sized bed, cable TV and AC - it also has a separate bathroom with rainshower. The villa is fully staffed with a separate staff house, but is also self contained with a fully equipped kitchen, so you can do as much or as little as you want. Pepper Jungle House offers a spacious, calm and relaxing environment, while keeping you connected with 4G wifi and cable TV. We look forward to welcoming you to Pepper Jungle House! An amazing place to stay. We spent Christmas week at Pepper Jungle House and had the best Christmas ever! This villa is only 10 minutes away from the hustle and bustle of Unawatuna but is set in the most amazing peaceful location. The staff, Chumindra and Lehiru, were great making sure that we had a great holiday. We ate at the villa for about half of our holiday. The curry we had on Christmas Day was fantastic and such good value for money. When not eating at the villa, Chumindra organised tuk tuks to take us wherever wanted. The villa itself is beautifully decorated with 3 large bedrooms and a large living space. The villa is very well maintained. There is lots to do near by, but quite honestly we didn't want to leave the villa! We would definitely recommend Pepper Jungle House and definitely want to return! It was an absolute pleasure to host you and your delightful family Gill. Come back next Christmas! We are so happy you all had a fantastic time at Pepper ! We stayed here for 5 days for a family birthday and could not have had a better time. The villa is beautifully styled, the full time staff are superb and the whole experience was unforgettable. Thanks for the lovely feedback. We are so glad you maxed out the Birthday celebrations and had a fantastic time. Come back soon...we will be here! A beautiful, modern, elegantly stylized property with everything you need. Sitting on a hill overlooking the jungle canopy the view is simply unmatched, a bird spotters paradise and the monkeys nearby are always entertaining to watch as they take their daily route. The staff will look after you to ensure nothing is too much trouble and the pool is extremely inviting. A stones throw from the local beaches and restaurants but this villa is a perfect place to simply relax in tranquility. Hi, thanks for staying with us at Pepper. We hope to see you again really soon! Come back to enjoy the birds and the monkeys. Pepper Jungle House is really pleasant. Perched on a hillside wither great views over the jungle canopy, you can enjoy cool air and tropical birds from a gorgeous infinity pool. The house is cosy but bright with a nice family feel. The interior is modern, with surprising touches of local art and craft. With a friendly and helpful staff to look after you it's a perfect place to enjoy tranquil days and yet be close enough to the main attractions around galle. Thanks so much for the lovely words, we are glad you enjoyed Pepper Jungle House as much as we do! We hope you come back soon! Wow! Truly beautiful and an amazing discovery!! An amazingly well designed villa with a beautiful interior. Gorgeous wooden floors throughout and homely finishing touches. Sweeping views over the jungle and not far from the local restaurants- a short tuk tuk. The food was excellent by Lahiru and I can highly recommend the whole fish. He does a good melting choc desert too! Not good for the waistline! Excellent breakfast and service from Chaminda who is happy to help with absolutely anything. Great knowledge on the area and things to do etc to keep you busy but to be honest lying by the pool was pretty relaxing. A great little find. Hi guys, thanks for the lovely feedback! It sounds like you had a fab time and enjoyed Lahiru's desserts as much as we do! Come back for more!!! Our stay was magnificent. The place was beautifully presented and the location was to die for. Will be recommending to all my friends and family. Can't wait to return!! Hi guys, thanks for staying with here at Salt. Come back soon! Whether you choose to lie around the pool and watch monkeys play in the trees, or jump into the local hustle and bustle, Galle offers an abundance of activities to suit everyone. In close proximity to Pepper Jungle House, you can be surfing, scuba diving, whale watching, exploring tea plantations, buying gemstones, visiting the UNESCO world heritage fort, washing elephants, cycling through rice paddies, eating local hoppers or haute cuisine and watching the sunset with a cocktail in hand. There really is something for everyone!